Our range of products include mineral water bottling plant. Machines are available for various bottle volumes and are available for capacities ranging from 1500 Bottles per hour in semi auto range and 2000 Bottles per hour up to 20000 bottles per hour in fully auto range. AGUAPURO offers complete project Licensing including BIS and FSSAI for Local India and for Exports, local License documentation help is provided. 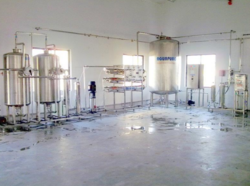 Looking for Mineral Water Bottling Plant ?